Man, you’d think that J.Cole, “Nobody’s Perfect,” was written at our house this weekend. We did make this for his mama. And there was a fair amount of cheese, eggs, and potatoes. And I do wish to travel to Barbados. Really, though. 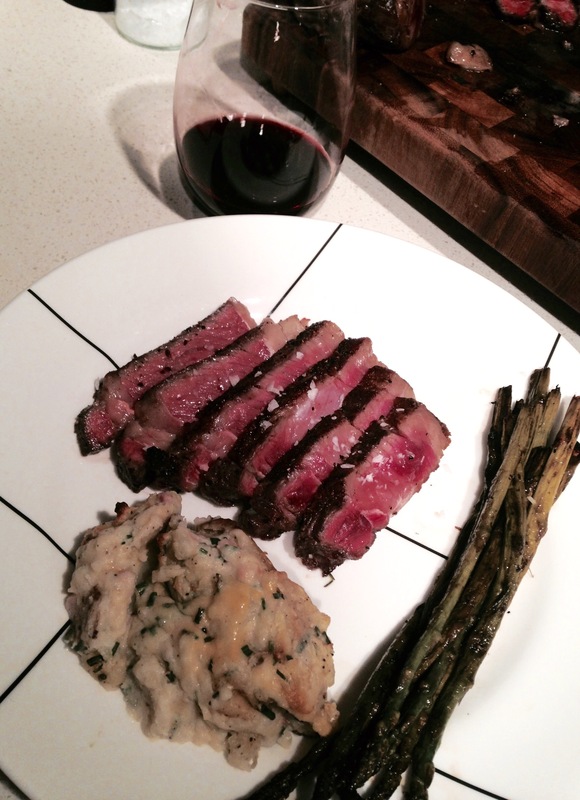 Grass fed ribeye and those tubers? Mmmmmm. The Chap was trying to convince us all that grilled asparagus would suffice. Are you kidding? My Midwest roots shirk for no one. And his parents agreed with me. Twice-baked potatoes reign supreme! Now, go make these for yo mama. J. Cole did. Scrub potatoes, and stab all over with a fork. Place in a casserole dish and microwave until soft, approximately 10 minutes, depending on the potato size and the power of your microwave. Allow to cool for a few minutes so you don’t burn the crap out of yourself. Cut off the top fourth of potato to make a “boat.” Toss tops into a mixing bowl. Gently scrape out the middle of the potato and toss into the bowl. If these are slightly under cooked, just stab the uncooked bits a tad more and microwave a few more minutes. Add all other ingredients to the potato guts. Reserve some (1/2 cup) of cheddar. Combine ingredients with hand mixer. Stuff “guts” back into the potato boats. Make potato guts mounds as tall as you wish on top of your boats as well. You will probably have extra guts that make a great side dish on their own, or to fry as potato pancakes. Just under the surface of the potato mounds, stuff with reserved cheese and sprinkle a bit on the very top. Bake at 375F for 20 minutes, until tops are browned.